The college of Medical Laboratory Technology (CMLT) is a prestigious institution of the country, imparting quality training in the field of Medical Laboratory Technology (MLT) since 1961. The CMLT is one of the integral components of the National Institute of Health (NIH) Islamabad and is widely recognized at the national and international level. The students of this college are serving the people all over the country and also abroad, earning foreign exchange and good name for the country. To strengthen the goal of National Health Care Delivery System through Human Resource Development by providing high quality academic and practical training in the field of Medical Laboratory Technology (MLT). 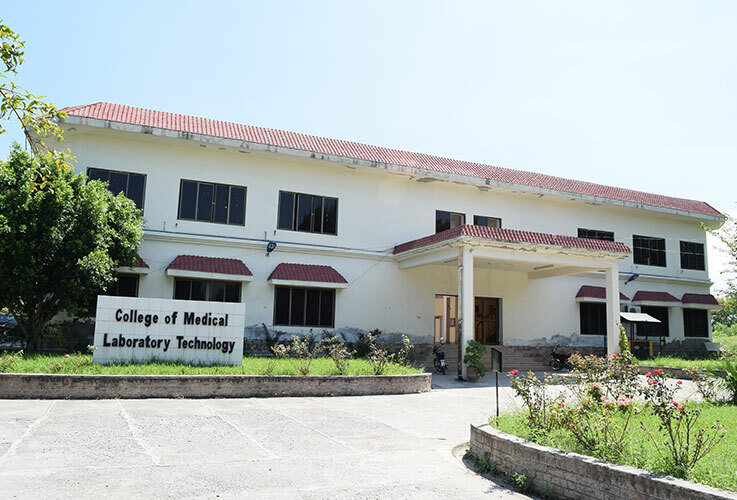 The CMLT was initially established as School of Medical Technology (SMT) at Karachi in 1961. It was the first School in the field of Medical Technology in Pakistan. It was established by the Government to meet the ever-increasing d e m a n d of c o m p e t e n t , well-trained M e d i c a l Laboratory Technicians. The SMT along-with other components of National Health Laboratories (NHL), Ministry of Health was shifted to Islamabad in 1965. In 1980, the NHL became National Institute of Health (NIH), an autonomous b o d y of the Ministry of Health, Government of Pakistan. Hence, the SMT became a fundamental and mandatory component of NIH. In 1989 the status of the School (SMT) was up-graded to the College (CMLT), and 02 5 ye ars B.Sc. (MLT) classes were started wi th affiliation of Punjab Universit y. In 1961, a certificate course of one year in the field of Medical Laboratory Technology was initiated. In 1970 the course was extended to one & a half year to incorporate the new developments in the field. In 1983, the duration was further increased to 02 years academic diploma course in order to equate with the intermediate level of formal education of the country. Later on the 02 years NIH diploma course was converted to HSSC-MLT in affiliation with Federal Board of Intermediate & Secondary Education (FBISE), Islamabad. In accordance with “National Education Policy 1998-2010”, “Education Sector Reforms, Strategic Plan 2001-2004” and as per guidelines of the Higher Education Commission of Pakistan, a 04 years B.Sc. (Hons) MLT degree program was s t a r t e d in 2007, in affiliation with King Edward Medical University, Lahore. In 2012, the college was affiliated with the Punjab University, Lahore. Now the college is affiliated with Shaheed Zulfiqar Ali Bhutto Medical University(SZABMU) PIMS Islamabad.